Are you concerned about Clinical Hypnotherapy and what it might involve? I act as a facilitator, guiding your unconscious mind to find the perfect solution to your unique problem. When it is appropriate, I incorporate other related scientifically proven techniques such as NLP (Neuro-Linguistic Programming) and EFT. The techniques I employ are safe, relaxing and effective.The actual experience of being hypnotised is very difficult to describe. It is neither asleep nor awake. All hypnotic states are characterised by a pleasant state of relaxation, an altered state of consciousness into which individuals allow themselves to enter so that beneficial suggestions may be given to the unconscious mind. 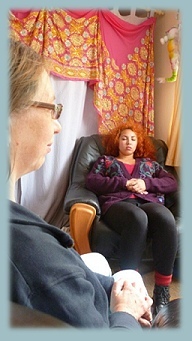 The individual creates their own therapy with the Hypnotherapist acting as a facilitator. Thus, hypnosis is a natural, safe and effective way of making contact with the inner (unconscious) self, a source of many of our problems as well as a tremendous reservoir of unrecognised potential strength and knowledge. No-one can be hypnotised against their will and even when hypnotised, people can reject any suggestions given if they consider them to be inappropriate. This makes hypnosis a very safe therapy. In fact because we are all unique each therapy is equally unique. The hypnotherapist facilitates the process and the patient creates their own solution to their problem via their unconscious mind.